This review has not yet been approved by the owner of this writing service. If you are the webmaster of Writingservice.net, please Contact Us to approve or remove this review. If you want to deal with this service you may just as well skip looking through their website altogether. You will find their e-mail on the main page, and it is about all that is useful on the entire site. Prices table is mostly useless as it only tells you rough estimations of how much this or that paper costs, query form redirects to e-mail anyway – so, if you want to deal with them, you may simply write a message and ask about everything you are interested in. The prices here, just as usual, depend on the academic level of the assignment and the deadline you set. There are, however, some other aspects that may influence the overall price, like the complexity of the order, which may be high or low irrespectively of its actual academic level. The customer support states that the prices you may see in the table on the site are approximate at best – in order to find out how much your assignment is going to cost, you have to forward all its details to the service’s e-mail. Nevertheless, generally essays cost from $16.49 to $35.49 per page. There are two ways to contact the customer care team (and to place an order as well): e-mail and query form. The answer to the latter, however, comes to your e-mail anyway, so there is no great difference. Not the most convenient and easy-to-use system, but it works surprisingly well, if you are ready to wait for an answer a little bit. The support team usually answers you in less than an hour and, unlike most chat-based support teams, they give detailed and complete answers. The samples presented on the website can lead you to one of two conclusions: either they were randomly collected somewhere on the Internet or, if they are really written by the service’s employees, these employees belong to wildly different levels. Some are quite professional, while the others’ writings are rife with grammar and factual errors. 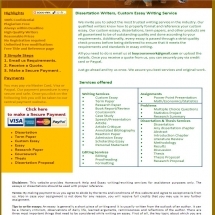 You can get a plagiarism report from writecheck.com for a small fee. This service is a common specimen for its line of business, but there are several aspects that certainly don’t cast a favorable light upon it: absence of registration, real-time support system and order forms, and especially – of refunds. The one redeeming feature is the support team who manage to do their job even though they have to do it via such an imperfect system.